It is not about individual drugs or individual companies. It is about the principles - the laws - of the pharmaceutical 'business with disease'. The pharmaceutical industry is not a 'health industry', but an 'investment business' that thrives on the continuation and expansion of diseases. The pharmaceutical industry makes more than 500 billion dollars in profits each year - but only as long as disease exist as their markets. The pharmaceutical industry has built the largest fraud business in human history: it promises health to millions of people, but - instead of providing health - the drug industry delivers ever more diseases, because diseases are the economic basis for the existence of this investment business. The multi-billion 'merchandise' of the pharmaceutical industry is synthetic drugs that are patented, in order to ensure huge profits from patent fees. Only newly invented synthetic molecules can be patented, which explains the toxicity and death rate in people taking these drugs. Building this 'business with disease' over the past century, the pharmaceutical industry has raked so much money from this organized fraud that it has become one of the largest and most profitable industries on our planet today. To cover the genocidal dimension of its fraud business, the pharmaceutical industry is spending twice the amount of money it spends on research in order to manipulate public opinion and to cover its 'business with disease' by spreading the false promise of healthy drugs. Vitamins, micronutrients and other natural health approaches are the arch-enemies of the pharmaceutical industry, because they are not patentable. Even more importantly, they effectively help prevent and control diseases, because they correct the malfunction of millions of cells in our body as the primary cause of disease. Half a dozen of Nobel prizes have been awarded for scientific breakthroughs in vitamin research - yet all this knowledge has been banned from being applied to medicine in favor of the multi-billion dollar investment business with patented drugs. Every country has to decide whether it wants to maintain a pharmaceutically oriented healthcare system based on the expansion of diseases - or whether it wants to develop a new healthcare system based on effective, natural health with the goal to prevent and eventually eradicate diseases. The pharma-fraud business, obviously, is not a naturally grown business. From the very beginning, about a century ago, it was designed and constructed as a giant organized fraud feeding on the health and lives of every man and woman on this planet. The unscrupulous architects of this largest fraud in the history of mankind are listed below. These stakeholders of the drug cartel and their puppets in medicine, media and politics, active until this day are responsible for more deaths than in all wars of mankind taken together. 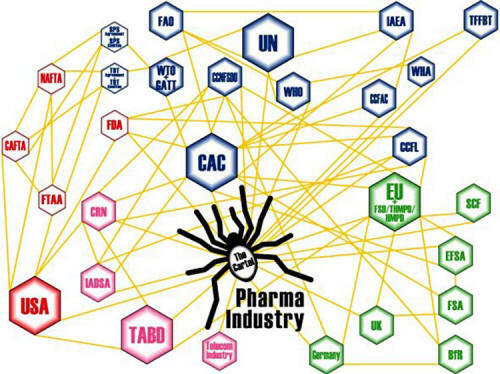 It is sometimes difficult to understand the complex relationships that exist between the key international bodies, governments, trade associations and other entities concerned with health. The supreme court of the U.S. finds John Rockefeller and his Trust guilty of corruption, illegal business contact and racketeering. As a result of this decision, the entire Rockefeller Standard Oil-Trust, the world's largest corporation of this time, was sentenced to be dismantled. But Rockefeller was already above the supreme court and did not care about this decision. he uses the illegal gains from his robber-practices in the oil business to launch the Rockefeller Foundation. This tax haven was used to strategically take over the health care sector in the U.S.. The Rockefeller Foundation was the front organization for a new global business venture of Rockefeller and his accomplices. This new venture was called the pharmaceutical investment business. Donation from the Rockefeller Foundation went only to medical schools and hospitals, which had become missionaries of patented pharmaceutical drugs, developed by a new breed of companies, manufacturers of patented, synthetic drugs. This was also the time, when the first vitamins were discovered. It soon became clear, that these natural molecules had live-saving health benefits and were able to prevent many chronic health conditions. The first books appeared with abandoned research about the health benefits of vitamins. These newly discovered molecules had only one disadvantage: they were non-patentable. Thus, already in its first years of existence, the pharmaceutical investment business faced a mortal thread: vitamins and other micronutrients promoted as public health programs would prohibit the development of any sizable investment business based on patented drugs. The elimination of this unwanted competition from natural micronutrients became a question of life and death for the pharmaceutical business. The Rockefeller Foundation uses the Spanish Flu epidemic and the media they already controlled at this time, to start a witch hunt on all forms of medicine, which were not covered by their patents. Within the next 15 years essentially all medical schools in the U.S., most hospitals and the American Medical Association all became pawns of the chess board of Rockefellers strategy to subjugate the entire health care sector under his monopoly of the pharmaceutical investment business. Disguised as a "Mother Theresa", the Rockefeller Foundation was also used to conquer foreign countries and entire continents for the pharmaceutical investment business - just as Rockefeller had done it a few decades ago with his petrochemical investment business. On the other side of the Atlantic, in Germany, the first chemical/pharmaceutical cartel is founded in order to compete with the quest for control of the global drug market by the Rockefeller trust. Lead by German multinationals Bayer, BASF and Hoechst, the I.G. Farben cartel was founded with a total number of employees surpassing 80.000. The race for global control was on. The Rockefeller cartel (U.S.A.) and the I.G. Farben cartel (Germany) decided to divide the entire globe into interest spheres, the very same crime, Rockefeller had been sentenced for 18 years earlier, when his trust had divided up the U.S. into "interest zones". The I.G. Farben cartel, equally insatiable, decides no longer to be bound by the 1929 constraints. They support an uprising German politician, who promises I.G. Farben to militarily conquer the world for them. With millions of dollars in election campaign donations, this politician seized power in Germany, turned the German democracy into a dictatorship and kept his promise to launch his conquest war, a war that soon became known as WWII. In each and every country Hitler's wehrmacht invaded, the first act was to rob the chemical, petrochemical and pharmaceutical industries and assign them - free of charge - to the I.G. Farben empire. In order to cement its global leadership with patented drugs, the I.G. Farben cartel tests their patented pharmaceutical substances on concentration camp inmates in Auschwitz, Dachau and many other sites. The fees for conducting these inhumane studies were transferred directly from the bank accounts of Bayer, Hoechst and BASF to the bank accounts of the SS, who operated the concentration camps. I.G. Farben's plan to take control of the global oil and drug markets has failed. The U.S. and the other allied forces won WWII. While many U.S. and allied soldiers lost their lives, their reward was little compared to the rewards of others. The corporate shares of the losers, I.G. 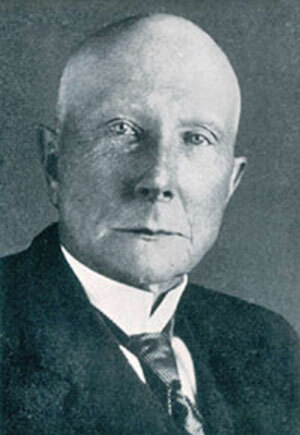 Farben, went to the Rockefeller trust (U.S.A.) and Rothschild/J.P. Morgan (U.K.). In the Nuremberg war crime tribunal 24 managers from Bayer, BASF, Hoechst and other executives of the I.G. Farben cartel were tried for crimes against humanity, including leading wars of aggression, slavery and mass murder. "without I.G. Farben, the second World War would not have been possible". Amazingly the real culprits for the death of 60 Million people in World War II - the I.G. Farben executives - received the mildest verdicts. Even those executives directly responsible for the crimes in I.G. Auschwitz received a maximum of twelve years in jail. 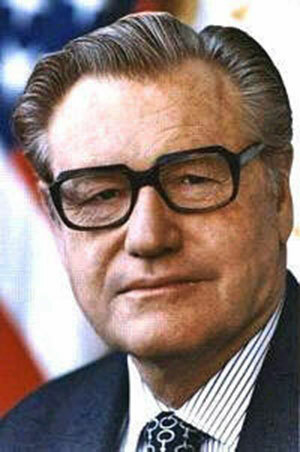 Already in 1944 Nelson Rockefeller had entered the executive branch of U.S. government. He started off as Under-Secretary of State and ended few years later as Special Adviser of President Truman for Special Affairs. In other words at critical junctures of the 20th century, the Rockefeller interests took direct charge. They decided the post war shape of the world and the distribution of its wealth. Under the influence of the state department, the verdicts in Nuremberg against the I.G. Farben managers can easily be explained. In return for taking over the corporate shares of I.G. Farben and thereby global control of the oil and drug business, Nelson Rockefeller made sure that the real culprits of World War II were not hanged. In fact, they were needed. The Federal Republic of Germany was founded. This was the first time in history, that the constitution and society of an industrialized nation could be planned and modeled as a fortress of the pharmaceutical investment business - an transatlantic outpost of the Rockefeller interests. Within a few years the I.G. Farben managers sentenced in Nuremberg were released from jail and put back into their previous positions as stakeholders of the Rockefeller interests. 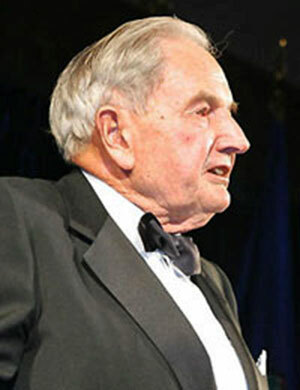 Fritz Ter Meer, sentenced to twelve years in jail for his crimes in Auschwitz, was back as chairman of the board of Germany's largest pharmaceutical multinational, Bayer. Already in 1963! The role of the Rockefeller brothers was not limited to taking over the global monopoly of taking control of the global oil and drug business. They also needed the political framework for this. Under their influence the United Nations were founded already in 1945 in San Francisco. To seize political control of the post war world, they used a trick to fight countries, three of them leading drug export nations, had all the say, while 200 other nations were rendered spectators. ...soon turned out to be nothing else than the political arms of the global oil and drug interests. On behalf of the Rockefeller interests, the government of the pharmaceutical banana republic Germany spearheaded one of the most infamous efforts ever made within the United Nations. Under the pretense of consumer protection, they launched a four decade long crusade to outlaw vitamin therapies and other natural, non-patentable health approaches for all member countries of the United Nations. The goal was to simply ban any and all competition for the multi-billion dollar business with patented drugs. copy for the entire world what they had accomplished in America in the 1920s - a monopoly on health care for their investment business with patented drugs. Since the market place of the pharmaceutical investment business are ongoing diseases, the drugs they developed were not intended to prevent, cure or eradicate diseases. Thus, the goal of this global strategy was to monopolize health for billions of people with pills that nearly cover symptoms but hardly ever address the root cause of disease. The deprivation of billions of people from having access to life saving information about the health benefits of natural health approaches and - at the same time establishing a monopoly with largely ineffective and frequently toxic patented drugs, caused disease and death in genocidal proportions. Linus Pauling and other eminent scientists deserve the credit of having kept the door of knowledge about the health benefits of vitamins and other effective natural health approaches open. If it were not for them, we would be living in a health prison already today, guarded by the gatekeepers of pharmaceutical business with disease in medicine, politics and the media. Linus Pauling also gets the credit of having identified the significance of my early research in vitamins and cardiovascular disease and having invited me to join him during his last years and to continue his life's work. This years will go into history as the beginning of the end of pharmaceutical business with disease. In a series of scientific publications - for some of them I invited Linus Pauling as co-author - I could identify micronutrient deficiency as the primary cause. to feed the insatiable greed of the pharmaceutical business with disease.